Today is International Women's Day. 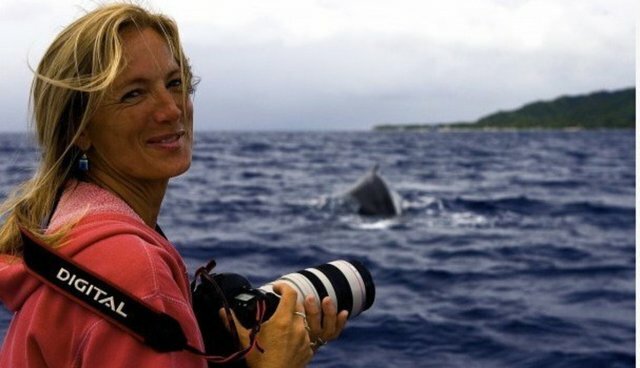 To celebrate, we're telling the story of Nan Hauser, an inspiring marine scientist who has devoted the last 22 years of her life to promoting whale conservation in the Pacific Ocean and around the world. Nan works in the Cook Islands, a country that you can think of as a "giant ocean state." Though small in size and population, the Cook Islands controls an enormous, and an enormously important, area of the Pacific Ocean. There, Nan does amazing, fascinating studies of whales and dolphins. During these studies, Nan has generated some of the most eye-popping footage of these animals you'll ever see. She's also making a real difference for the people of the Cook Islands. Nan's work helped spur the creation of one of the largest protected areas on Earth, a 1.1 million-square-kilometer park (bigger than Alaska!) that will help protect the tourism industry that accounts for 70 percent of the Cook Islands' national economy. Learn more about Nan, her work, and her videos in this blog post.